This is my second post for Amy Johnson Crow’s 52 Ancestors in 52 Weeks Challenge. You can read more about the Challenge, and find other bloggers’ submissions linked on Amy’s blog No Story Too Small. Last week I profiled in great detail all of the current information I have on my husband’s third great grandfather, Christ Roessler. So, this week, I thought I’d share the little bit of information I have on his wife Louisa. Her maiden name of Mansderfer/Mansderver is from Christ’s Pension Questionnaires filled out in 1898 (1) and 1899 (2) (see Christ’s post). The birth information I have for Louisa is found on her burial monument (12 Feb 1835) and is supported by the given ages in the census records. In the 1870 (3), the earliest census record I have found for the family so far, she is listed as 35 years old and having been born in Baden, putting her birth date around 1835. In the next census, 1880 (4), she is listed as 44 years old and being born in Bremen, birth date around 1836. I’m not up on my German principalities and timelines, etc so I’m not sure on which they came from, her birthplace matches Christ’s on both [Christ’s last census, 1900, stated Germany as his birthplace]. I know from one of her husband’s pension papers that Louisa died 5 July 1898 (2), and have a photo of her monument stone in the Birmingham Cemetery in Pittsburgh, Allegheny County, Pennsylvania (see below) that lists her death date on 7 Jul 1898. The “Pennsylvania, Pittsburgh City Deaths, 1870-1905” database, indexed on FamilySearch.org, lists her death date as 5 Jul 1898 (5), but her age as 53 with a birth year of 1845, which is possibly transcribed incorrectly, I will have to find the originals if possible. So, according to her headstone, Louisa was born 12 Feb 1835 and died on 7 Jul 1898, having lived 63 years. According to the pension papers, Christ and Louisa were married either on 22 Feb (2) or 3 Mar 1855 (1), which would put Louisa at just 20 years of age, once I get into those microfilmed church records held at the University of Pittsburgh Archives, I hope to be able to find their marriage entry, as well as the children’s births. I do not have any clue as yet to Louisa’s emigration to the United States, and if she married in Pittsburgh at the age of 20, she may have come to the US with family. I have not researched the Mansderfer name. She had at least 6 known children with Christ: Christopher, Henry, Lizzie, Caroline, Albert C, and Jacob. Jacob was not included in the pension papers (see previous post) as he died in 1894, prior to the first questionnaire Christ completed in June 1898. Try to find Louisa’s entry into the United States, did she travel with any family or friends? What was Pittsburgh life like during the Civil War while Louisa was home, seemingly alone, while Chris served his adopted country, with small children to care for? Department of the Interior Bureau of Pensions Questionnaire dated 15 January 1898, signed 6 June 1898. Department of the Interior, Bureau of Pensions Questionnaire dated 6 January 1899, signed 9 January 1899. “United States Census, 1870,” index and images, FamilySearch (https://familysearch.org/pal:/MM9.1.1/MZL7-NF3 : accessed 15 Jan 2014), Louisa Rosler in household of Chr Rosler, Pennsylvania, United States; citing p. , family 302, NARA microfilm publication M593, FHL microfilm 000552792. 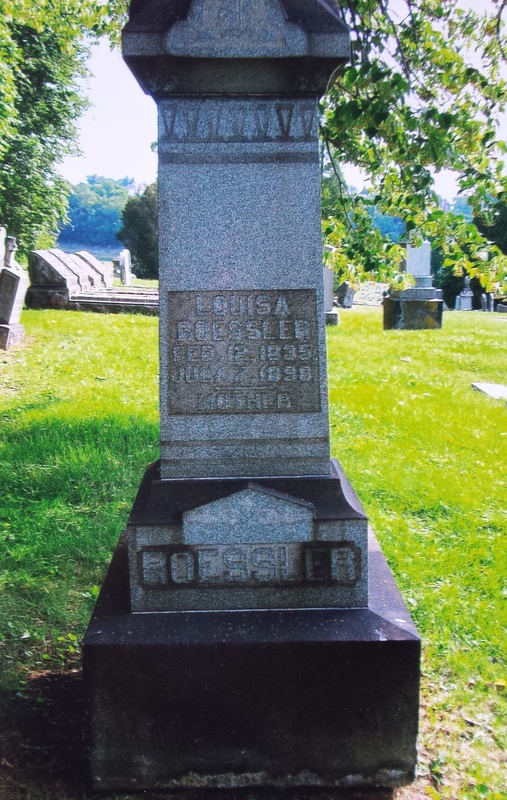 “Pennsylvania, Pittsburgh City Deaths, 1870-1905,” index and images, FamilySearch (https://familysearch.org/pal:/MM9.1.1/KFGS-MTG : accessed 15 Jan 2014), Roessler in entry for Louisa Roessler, 1898. This new blogging challenge, 52 Ancestors 52 Weeks, landed in my lap recently, and it seems that fate wants me to tell you about a man in my husband’s lineage whose name my children were born to. I’m a member of a Facebook group called Pennsylvania Genealogy Network and had added my ROESSLER surname to one of their surname files for researchers to find each other, my Roessler line being associated with Allegheny County. I was contacted just yesterday by a fellow group member noting that her mother-in-law was a ROESSLER from the county I had indicated. Fast forward a few back and forths and BINGO! we’re both interested in a couple who began our Roessler family here in the United States. While it appears I have more information document-wise, she is blessed to be closer both in location and in generations to this founding family. This couple was her husband’s great grandparents, as compared to being my husband’s third great grandparents. 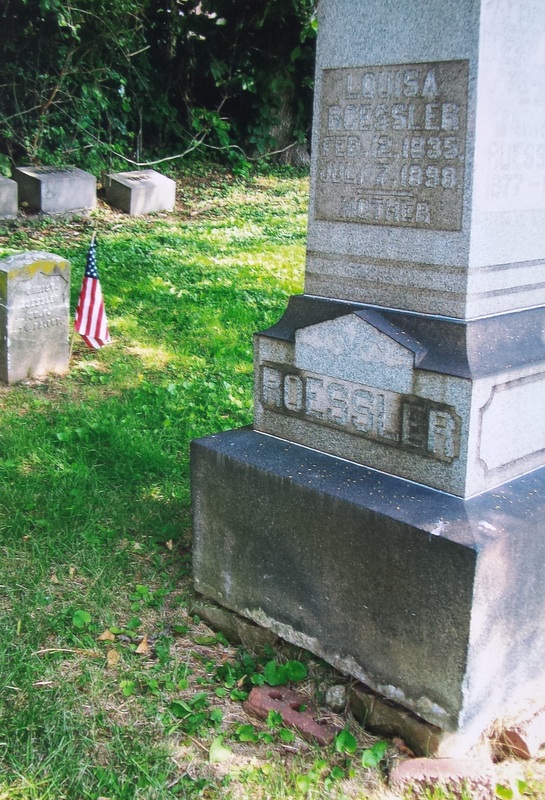 You can imagine, perhaps, that the stories his family has of the Roessler family do not reach back 4 generations to the days when they lived in Pennsylvania and therefore, this founding couple. So here is what I know of Christ Roessler. His name is always abbreviated as “Christ.” or “Chr” with the exception of his Muster Rolls, where his name is spelled “Christoph,” and once each as “Christian” and “Christopf.” Even his military headstone says “CHRIST. ROESSLER.” So I just refer to him as Christ. Christ was born 27 Aug 1833 in Baden, Germany (1), and he came to the United States prior to February 1855 (2), but I’ve yet to find any information on his emigration. He married Louisa Mansderver/Mansderfer on either 22 February 1855 by Reverend Zimmerman (2) or 3 March 1855 by Reverend Gilbert (3). In 1907, at the age of 73, Christ noted that at enlistment (1861) he was 5’8″ with light hair and complexion and gray eyes. He enlisted, at the age of 28, as a Private in Company F of the 74th Pennsylvania Infantry on 6 September 1861 in Pittsburgh, and that he was honorably discharged with the whole of his Company at Fort Ethan Allen in Virginia on the 16th September 1864 (1). I know that he received a $12 Pension, under Certificate No. 862566 (1), but two of his records include the number 600.322 (4) (5), so that needs to be further investigated. Christ alleged in 1887 to the Bureau of Pensions that he was wounded whilst in the service “disabled by a gunshot wound in head (scalp wound) recieved at Bull Run, Va Aug 27th, 1862” (4), but a review of his regimental records did not provide evidence of said wound (5). 2. Department of the Interior, Bureau of Pensions Questionnaire dated 6 January 1899, signed 9 January 1899. 3. Department of the Interior Bureau of Pensions Questionnaire dated 15 January 1898, signed 6 June 1898. 4. Department of the Interior Bureau of Pensions letter dated 8 April 1887 requesting records from the War Department regarding an injury suffered during the war by Christ Roessler, Private, Co F 74th PA Inf. 5. War Department Adjutant General’s Office letter dated 31 May 1887 in response to (4) with service details, no evidence found in records of said wound. 8. United States Pension Agency, Pensioner Dropped, Christ Roessler, Certificate No. 862.566, died 24 March 1909, dated 25 March 1909. I am blessed to have been given a bunch of documents that may just comprise the entirety of Christ’s military file, but as they were hand-me-downs, I’m not certain at this time, but I do have a lot of it! I have 4 pages of legal-sized photocopies of his Muster Rolls dating from 31 Dec 1861 to 16 Sep 1864 when he mustered out at Fort Ethan Allen in Virginia. Christ was sent on several recruiting missions back to Pittsburgh while he was in service, as noted on his Muster Rolls (6). Also included is the accounting of his pay, he was last paid 30 Apr 1864, but did not muster out until 16 September 1864. He was due $9.09 on his clothing account since last settlement date of 29 February 1864, he was also due $100 in Bounty, and had a Stoppage on his account for $2.48 “for one Rubber Blanket not paid” (7). Muster Rolls of Christ Roessler, page 1, spanning dates 31 Dec 1861 – June 1862. Muster Rolls of Christ Roessler, page 2, spanning dates July 1862 – Dec 1862. Muster Rolls of Christ Roessler, page 3, spanning dates May 1863- Dec 1863. Muster Rolls of Christ Roessler, page 4, spanning dates Jan 1864 – Aug 1864. As the birth date of Christ (the younger) does not change, I am doubtful Henry was born 6 months after him, so the November 1856 date is more likely for him, and subsequently the September birth for Lizzie. Caroline is a post-war baby, so either date is feasible. Albert Charles’ birth date is definitely closer to the 1876 date, even though it is a large gap, based on his 1880 and 1900 census records. The Roesslers were members of the German Evangelical Church of Birmingham, now the Birmingham United Church of Christ, and I have contacted them for more information, and thankfully their records from 1843 – 1977 have been archived at the University of Pittsburgh Archives Service Center, which is on my ToDo List for this year. I’d love to get my hands on the marriage record of Christ and Louisa, and the birth/baptism records of the children. Christ died on 24 Mar 1909 (8), and is buried in what is now known as Birmingham Cemetery in Pittsburgh, PA, though I’ve also heard it referred to as Zimmerman. He has a memorial listed on FindAGrave. A fellow descendant visited his resting place in 2013 with her dad, a great grandson of Christ’s, and is kindly allowing me to share her photos with you, thank you Karen! Roessler Family plot at Birmingham Cemetery. Large monument includes Louisa, wife of Christ Roessler, and their son Albert Charles (and wife Marie), military headstone of Christ to the left. Footstones along the tree line are believed to be a part of this plot as well. When did Christ journey to the United States, and from where? Did he travel with any other family? Search the microfilm records of the church for any mention of Christ and his family. Request the full military pension file for Christ to determine if there are any pieces missing from what I was given. Did Christ become a Naturalized Citizen? When? Would he have had to be a Citizen to enlist in the Civil War? Start a Descendants Project for all of the descendants of Christ and Louisa. “ACT OF FEBRUARY 6, 1907 DECLARATION FOR PENSION,” 23 March 1907. Department of the Interior Bureau of Pensions letter dated 8 April 1887 requesting records from the War Department regarding an injury suffered during the war by Christ Roessler, Private, Co F 74th PA Inf. War Department Adjutant General’s Office letter dated 31 May 1887 in response to (4) with service details, no evidence found in records of said wound. 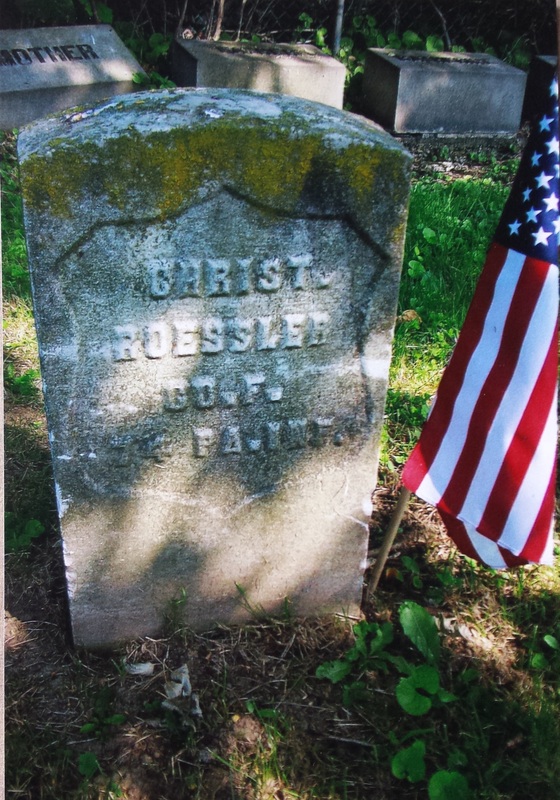 Muster Roll Records of Private Christ Roessler, Co F. 74th PA Inf, dates spanning 31 Dec 1861 – Aug 1864, 4 pages. Muster Out Account Record, dated after 30 Apr 1864. United States Pension Agency, Pensioner Dropped, Christ Roessler, Certificate No. 862.566, died 24 March 1909, dated 25 March 1909. 52 Weeks 52 Ancestors: Challenge Accepted. I’ve been feeling awful about my lack of consistency in my own chosen projects. It shouldn’t come as a shock to me, I’ve had a problem with following through for as much of my life as I can imagine I made such attempts to start things. Trust me, my mother can tell you all about my habit of leaving things unfinished. I have not broken this habit in the first 30+ years of my life, hopefully that won’t be true for my second 30+ years. While the intent is to never really “finish” my genealogical adventures, I do want to be more consistent. I do want to leave a tangible record of my attempts and research for my children and others who might find themselves kin to them in some way. I think she struck a chord through the genealogy blogging sphere if the comments and the number of folks joining in is any indication. So here we are friends and family. Me making a commitment to this project. Hopefully, I’ll post more than just that, but still. Baby steps. I can do this. Won’t you join me?